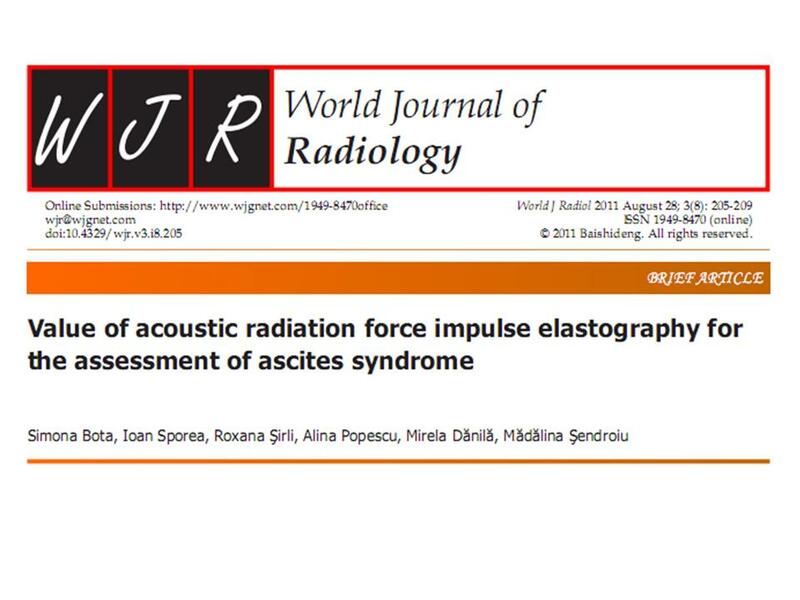 AIM: To assess the feasibility of performing acoustic radiation force impulse (ARFI) elastography in patients with ascites and its predictive value for the cirrhotic or non-cirrhotic etiology of ascites. METHODS: Our study included 153 patients with ascites, mean age 58.8 ± 13.1 years. One hundred and fifteen (75.2%) patients had ascites in the context of cirrhosis, 29 (18.9%) had non-cirrhotic ascites (diagnosed by clinical, ultrasound, endoscopic and/or laparoscopic criteria) and in 9 (5.9%) cases we could not establish the etiology of ascites. We performed 10 ARFI measurements and the median value was calculated and expressed in meters/second (m/s). Among the 29 patients with non-cirrhotic ascites were included: 20 laparoscopically demonstrated peritoneal carcinomatosis with histological confirmation, 7 acute pancreatitis with ascites which later resolved, and one case each of lymphatic ascites and ascites in the context of a liver abscess. 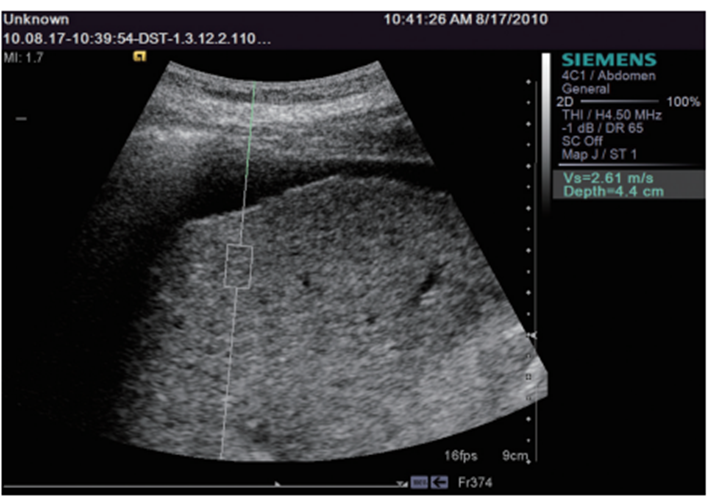 In 11 of the 20 patients with peritoneal carcinomatosis, the liver structure was homogenous in the ultrasound examination and in 9 patients the ultra-sound exam revealed liver metastases. RESULTS: We could not obtain valid ARFI measurements in 5 patients (3.2%). The mean liver stiffness measurements by means of ARFI were statistically significantly higher in patients with cirrhotic ascites than in those with non-cirrhotic ascites: 3.04 ± 0.70 vs 1.45 ± 0.59 m/s (P < 0.001). For a cut-off value of 1.8 m/s for predicting cirrhosis (and ascites in the context of cirrhosis), as obtained in a previous study, ARFI had 98.1% sensitivity, 86.2% specificity, 96.4% positive predictive value, 92.5% negative predictive value and 95.6% accuracy for predicting cirrhotic ascites. For a cut-off value of 1.9 m/s the accuracy was 94.9% and for a 2 m/s cut-off value it was 92.8%. CONCLUSION: ARFI elastography is feasible in most patients with ascites and has a very good predictive value for the cirrhotic or non-cirrhotic etiology of ascites. © 2011 Baishideng. All rights reserved. Ascites syndrome is a quite common discovery in abdominal ultrasonography and several methods are used to establish the cause of ascites. 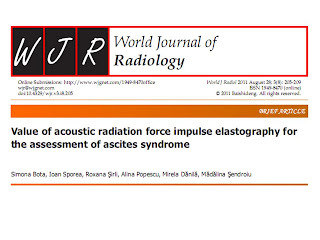 Acoustic radiation force impulse (ARFI) elastography is a new method, based on ultrasound, used for the evaluation of liver stiffness. The advantage of this elastographic method compared to transient elastography, is that it can be used in the presence of ascites. In our study, ARFI was determinable in 96.8% of the patients with ascites. ARFI had a very good accuracy (95.6% for a 1.8 m/s cut-off value) for the prediction of cirrhotic or non-cirrhotic etiology of the ascites. This study supports the conclusion that in the investigation of an ascites syndrome, the first investigation that should be performed after abdominal ultrasound should be ARFI elastography. This is an interesting cross-sectional study evaluating liver stiffness by ARFI in subjects with ascites. The authors noticed higher values in subjects with cirrhosis, which is biological plausible. Additionally authors presented some cut-off points which could be used for the diagnosis of cirrhosis in subjects with ascites. This study is clearly presented and is well written; however, some revisions are needed to improve the manuscript.